During my recent CVS haul, I also grabbed one of the new Triple Shine polished from Sally Hansen. I really wanted to try them, and I was having the damnedest time finding them. 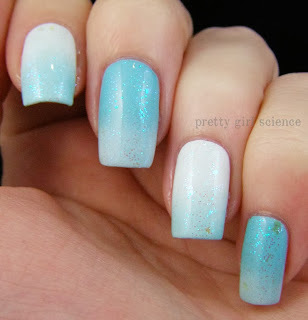 I finally chose a light teal glittery/flaky polish...and I immediately fell in love. I knew that it would be great over a soft teal, but I wanted to show it over white as well...and since I'm me, I ended up doing a gradient.